Alpha Sigma Chapter circa 1946-47, from the Collection of Bro. Francis L. Hall. L-R Standing, Bro. JLS Holloman, Founder A. Langston Taylor, Bro. 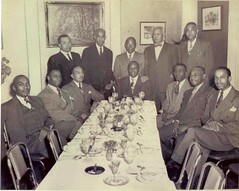 George A. Parker (National President 1944-47), other two standing, not identified yet.